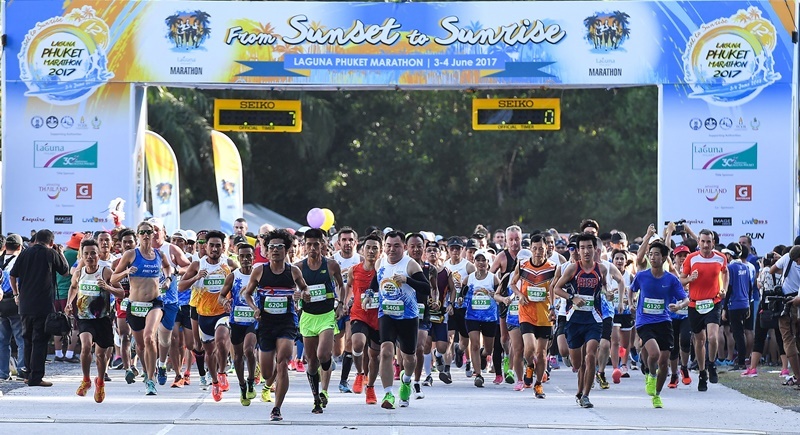 MARATHON: South East Asia’s Leading Destination Marathon, the award-winning Laguna Phuket Marathon, will take place at the Laguna Phuket resort complex on Bang Tao Beach on June 9-10, 2018. Organisers of the Laguna Phuket Marathon are expecting another record turnout in 2018. Organised by leading event organiser Go Adventure Asia, Laguna Phuket Marathon has been certified by AIMS (Association of International Marathons and Distance Races) for a 13th consecutive year and remains a qualifying event for the Boston Marathon. Now in its 13th year, the event was voted a “Top 10 Best Marathon” in Thailand by Wingnaidee for the second year running, and as the event continues to grow organisers expect to break 8,000 runners from more than 50 countries to “Run Paradise” this year. Improvements have been made to the half marathon and marathon courses, and for the first time a new Marathon Team Relay has been introduced, whereby each team has to have four runners. The Kids Run (2km), 5km and 10.5km start the running festival on June 9 in the late afternoon, while runners in the 21.097km (half marathon), 42.195km (marathon) and Marathon Team Relay compete on June 10 in the early morning. All races categories are timed.